Like most women of color ( no matter what your hair texture is ) the thought of fully giving up the "creamy crack" scares the life out of you ... And it did me ... still does ... but its a work in progress. Sometimes we spend so much time on covering our imperfections up .. that we forget to take care of them and they grow to become problems. I'm learning to TAKE CARE of the things that make my nose scrunch up when I look in the mirror... rather than cover them up .. I decided to have a little fun ... 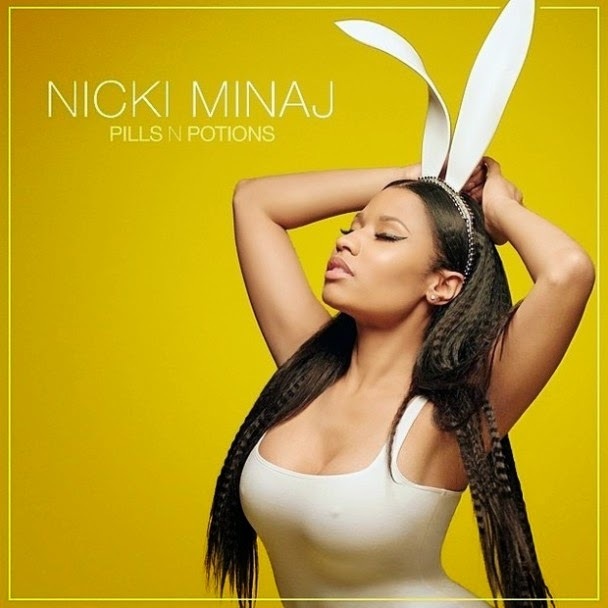 I saw the bunny ears that Nicki Minaj had on the cover of her new album " Pills N Potions"
I purchased some Decorative Wire from Micheal's ( they had it on clearance for $2.49) and a set of three small headbands from Walmart. The process was rather simple , I started from the bottom of the headband wrapping it around until I got to where I wanted my ears to began . I then shaped out the first ear and then clipped off the access wire. I repeated the process with the other ear and clipped of the access. Next, I made covers for the ears by tracing the outline of the ear on the fabric cutting it out then sewing it. Last step was to wrap the headband with pieces of fabric . If you dolls are interested in seeing this process please let me know and I will gladly do a DIY !! This summer is going to be a HOT one... Stay warm hunnies !!! Hope you all like . Until Next Time XOXOXOXOXO !! You GO Mrs. Crafty Chick! I love it! Change is sometimes uncomfortable but usually ALWAYS good! WERK!!! Lovin the Chucks!! Gotta get me a white pair!